you can prevent their chronic effects! Injuries can be very troublesome at the time they occur, with pain, inflammation, lack of mobility and more. But when not treated at a deep level, they often set up chronic effects, such as arthritis. Injuries are common, be they from sports, play, incidental or accidental. Everyone suffers from them at some stage in their lives. No-one is immune. Children tend to fall more as they learn and develop, but generally suffer little more than a scraped knee or wounded pride. Surgery creates injury by its very nature and accidents are not uncommon. It is often the sports people who tend to suffer the more serious injuries. It is little wonder that professional sports people like to keep their favourite therapist on hand at a game. There are a variety of different ways to approach the treatment of injuries. You have probably tried most of them. But there is one you may not have tried. One you may not even know about. And one which has the deepest and broadest ability of all. And this is not just my bias, my opinion, as you will soon see. Homeopathy is a natural and complete form of medicine. It is different from most medical disciplines as it works by increasing your immune response, rather than on treating the localised problem, or worse, suppressing the symptoms. This approach is currently not in mainstream consciousness, so it may challenge your thinking. The fact is, despite our lack of understanding as to how it does work, homeopathy DOES work. And it can work very fast and clear every link, every remaining residue of the injury, leaving a complete and full recovery. Did you know that we don’t understand how electricity works? Sure, we can harness it and use it. But the jury is still out on our full understanding. But that doesn’t stop us using it. The same should be with any and every other discovery we make. Why do we have to understand something to use it? The reality, of course, is that we don’t. We want to know the range of its effect and that it does no harm. But then, the way is clear to fully use it. By using something, we gain more understanding. One of the most common after effects of an old injury is arthritis later in life. Your GP will tell you it is almost inevitable. But it isn’t. You can clear all residue completely. Just not with mainstream medicine. Pain is one of the most debilitating effects of injury. Chronic pain can make you irritable. The analgaesics prescribed to suppress the pain are liver toxic. This leads to a lowering of your immune system and a greater tendency to anger and frustration. Often, they don’t work and stronger and stronger ones are given, creating a spiral of toxicity. Pain can so interfere with your daily life, your home and work life, that people are willing to take anything, even a damaging substance, just to get some relief. Through a skin or flesh wound, an infection can gain entry. This can be mild or systemic. Antibiotics can certainly clear away the bacteria from such an infection, but they also cause other untold damage. Bacteria is vital to life. You need it to survive. And any antibiotic will interfere with those other than the targeted over supply. It is common for people to suffer with digestive disorders after a course of antibiotics. The gut is teeming with bacteria and you need it for good and efficient digestion. Tetanus is a rare problem, but a potentially scary one. can be used at home without having an expensive but professional therapist in your pocket? I know of nothing else that answers all those points, than homeopathy. I’m a natural health therapist. I qualified as a homeopath in the year 2000. I’ve been in full time practice ever since and I love what I do. This is my third career, and definitely the most fulfilling. I use homeopathy exclusively in my clinic, because it is so fast in its action and so complete in its cure. I know of no better system. Having said that, I do make some recommendations regarding diet and lifestyle, if I see a disturbing trend in these areas. But, with a good homeopathic prescription, the person will now see the changes they need to make. It balances them and restores order. I have always run home prescribing classes to teach people how to use some of the common remedies at home. I love to empower people, so they can do what they can before calling on the services of a professional practitioner. Often this isn’t necessary, if they know their stuff. Homeopathy can treat every known condition, because it treats the patient, not the disease, because it works at restoring harmony where there is imbalance. Colds, fevers, injuries, bites, headaches, all the common complaints every family experiences can often be fully resolved under good homeopathic home prescribing. Viruses, bacterias, fungal infections can disappear as fast as they appear. Of course, there will always be times when a professional therapist is needed. But the more you use homeopathy, the fewer these incidents are likely to be. Home prescribing classes are great if there are some happening near you and if they are conducted at a time suitable for you. It doesn’t often happen that both these prerequisites are suitable. But with the marvelous invention, the internet, these are no longer required. You can learn on line, at the time most suitable for you. I see a lot of recent injuries in my clinic, but many more chronic effects of injuries. Some people have simply learned to live with them. Others come to seek relief from the associated symptoms. Bert came to see me about the limited range of movement in one arm. He had been involved in a bad motor bike crash some years ago. He had broken 17 bones and had been in hospital for many months. One arm had a limited range of movement - he was unable to lift it higher than the horizontal and swinging it sideways still caused him pain. His doctors told him it would never fully heal, to allow full movement. I started his treatment off with a common injury remedy. I saw Bert a month later and he could now use his arm more fully. At the next visit a month later, he had full use of it, bringing it up over his head. He had no pain. Had he know about homeopathy at the time of his accident, he could have saved himself years of limited arm movement and pain. But he didn’t even need to see a professional homeopath, because the remedy I prescribed is a common one, that every homeopathic home prescriber knows well. Alf came to see me after he had badly burned his hand. He said the remedy worked like a switch. In only a couple of minutes after taking the indicated remedy, the pain switched off, never to switch back on. His hand healed so well in a single week, he was able to resume his manual work. Again, had he known about homeopathic home prescribing, he could have treated the burn himself, although bad burns are better treated by a professional. Professional therapists do have the advantage of allaying your fears, as they know what to do quickly. But that comes not just from knowledge, but also from experience. Which you will gain if you use the remedies. I know that many people find the scope of homeopathy incredible. I did at one time. Now, it’s just routine for me. I expect it to happen. Globally, we have been lead to believe limitations in healing. But the body is infinitely wise and capable. Provide it with the right circumstances and you can expect ‘miracles’ to happen regularly. ‘Miracles’ can and should be a normal, every day occurrence. One of the many cases that Dr Dorothy Shepherd sites in her books, including Magic of the Minimum Dose, is of a stable hand who was bitten by a horse. He developed septic tenosynovitis and cellulitis which was moving up his arm. Another case she recalls is of a farm labourer who was pierced in the shoulder by a pitch fork thrown by an angry co-worker. His condition was very serious by the time she saw him. Not only was she able to completely cure both cases with her astute use of homeopathic remedies, but they were the common remedies you find in every homeopathic first aid kit. Any and every physical disturbance, be it an injury or a disease, is only created when you have inner imbalance. When this is present, your immune system cannot function how it was designed to. Homeopathy works by raising your immune system. This may not be by much when an injury is being treated. But enough to allow a full cure. If you are someone who gets repeated injuries, then a deeper treatment is necessary, which can only come from the knowledge and wisdom of a professional homeopath. There are two investments that I consider to be essential to everyone who cares about the health and well being of themselves and their family. One is the purchase of a homeopathic selection of common remedies, such as a first aid kit. The second is a resource that teaches you how to use them. While every quality homeopathic home prescribing kit comes with a little booklet, the instructions are inherently limited. A comprehensive teaching method will teach you how you can really get into the use and symptoms of each remedy. Then to test it out, first in theory, then in practice, under the guidance of your teacher. My extensive home study course covers all the common injury homeopathic remedies and how to use them. It also helps you understand them by creating exercises that you need to think about. Answers are included. What do you get from this home study course? Being able to treat a serious soft tissue injury at your son’s football game, so he can play again tomorrow. Being able to speed up the slow healing of your partner's damaged tendon/ligament. Helping your mother recover from an operation that is causing her pain and lack of mobility. Helping your daughter’s pain from a serious fall on her coccyx. Nerve pain can be one of the worse pains to suffer with. Allaying the pain from a burn. Along with nerve pain, the pains of burns can be very intense. Quickly reducing the pain and inflammation from a bite. The pain of a broken bone can be intense, but this can melt away with the appropriate homeopathic treatment. The shock of an injury can last a life time. Imagine being able to cure it immediately it comes up. Infections can be both prevented and treated quickly and efficiently. Bites, from any source, be they insects, cats, dogs or poisonous animals, all carry the risk of infection, that can be systemic. Yet all can be effectively treated with appropriate homeopathic medicines. Not only are homeopathic medicines suitable for people, they are equally suitable for animals. It takes a slight shift in our understanding, as the animal can’t give most of us subjective symptoms. But the essence is the same. Body workers, such as masseuses, chiropractors, physiotherapists or osteopaths can be incredibly helpful with the chronic effects of injury. But you can drastically reduce your need for them, with appropriate homeopathic treatment, whether from home prescribing or from a professional homeopath. Of course, learning all this knowledge takes time. But the more you learn, the more you use the medicines, the more proficient you will become. And when an emergency does crop up, you know who to turn to. Rasa, a young female cat, was bitten badly on a front leg. The leg swelled up overnight and she became exhausted, preferring to lie down at every opportunity. I suspected a rat or a poisonous snake, after I saw the puncture marks. The leg was very painful to touch. Rasa is an otherwise healthy cat, with a strong immune system. So she didn’t suffer as badly as many animals would. Although unwell, she never missed a meal and ate with her normal enthusiasm. She needed several different homeopathic medicines, as the symptoms changed, but within two days her leg was no longer swollen or painful. She limped a little for another few days. By day five, she was totally normal except for the lost fur around the healing bite marks. It’s not uncommon to be off work while serious injuries heal. That may not be too big a problem if you are covered by health insurance. But not everyone is. And often those that aren’t just can’t afford a drop in income. Most medical care is subsidised now, so the fees may be minimal. But the medication usually isn’t. And free treatment is not available for animals. Veterinary bills are known to be high, sometimes painfully so. But there is more that you save. Complete healing, faster healing, rapid pain resolution are all huge benefits that you can expect from appropriate homeopathic treatment. Be prepared and start your learning today. I do know that many homeopaths sell this type of product for hundreds of dollars. I have seen some for thousands. And I sincerely believe that it is worth it. The savings you make can never be measured in money alone. But I want this information to be available for everyone, not just those who can afford it. And you can get more than your money back the very first time you use a homeopathic medicine effectively. So I’m selling it for $37. You can easily get that back in a single prescription of analgaesics and anti inflammatories, let alone the price of a consultation. Yet, you have the information for life. expenditure on injury related problems. You do the maths. Add it all up and see what the cost comes to. I can imagine that it will be many hundreds of dollars. Maybe more. And that’s only the financial cost. All these situations, and more, can be helped in part or completely, when you become a proficient home prescriber. Whether you are looking to protect yourself and your family in the future or wanting to help a current injury, now is a good time to act. clicking on the payment link and claiming it. 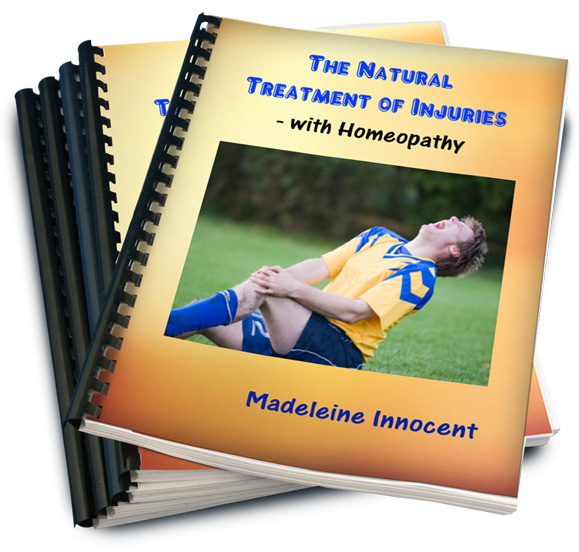 "The Natural Treatment of Injuries - with Homeopathy™"
works on all Windows® and Mac® platforms, as it’s in PDF form. ** While the potential for a full cure is always there with homeopathy, health is complicated, so there can never be any guarantees offered (with any health discipline). ***To convert to your currency, please click here.